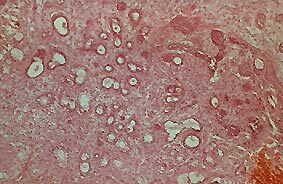 A 42 year old woman came to the attention of a hospital dental clinic because of these bilaterally ulcerated swellings of the palate. They were soft but not cystic to touch and had necrotic centers. According to the patient, they had been present for several weeks. There are very few bilateral lesions with this clinical presentation. Certainly, necrotizing sialometaplasia would be the primary consideration. Slide 1 (low power, H&E). 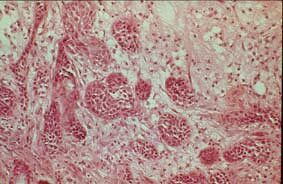 This slide demonstrates fragmented tissue with degenerating mucous glands on the left and islands of squamous cells on the right. Slide 2 (medium power, H&E). 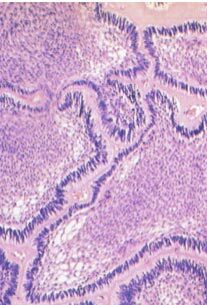 This slide shows ductal structures lined by epithelial cells and on the right, islands of squamous cells (this represents sialometaplasia of the ducts). Slide 3 (high power, H&E). 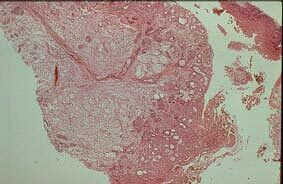 This high power view shows sialometaplasia and mucinous material.